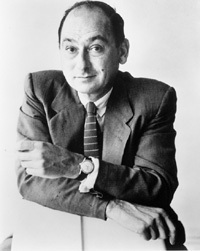 Architect, furniture designer and author George Nelson was one of the most influential figures in postwar US design. He was born in Hartford, CT, graduated from Yale in 1931, and while doing postgraduate work at Catholic University, Washington, DC he was awarded the Rome Prize in architecture in 1932. Nelson became assistant editor of Architectural Forum in 1933, and in 1934 wrote an anonymous February article in Fortune magazine, "Both Fish and Fowl," that had a dramatic impact on the new field of Industrial Design. He established his own office in 1936 in association with William Hamby, which continued until after the war. He became co-managing editor of Architectural Forum with Henry Wright in 1943 and wrote an article in the Saturday Evening Post, "Grass on Main Street," that introduced the concept of pedestrian malls. In 1945, he and Wright developed the unique concept of storage wall systems, an outgrowth of their joint book just published, Tomorrow's House, which was featured in Life magazine and attracted a great deal of public attention. It led directly to Nelson's appointment as Director of Design for the Herman Miller Furniture Company, who produced a realization of his storage wall concept called the Basic Cabinet Series. Nelson headed design for the Company until 1965. In 1947 he opened his own design studio while continuing with Herman Miller and designed its Executive Office Group. Its L-shaped desk became the forerunner of the "work station." In 1949 he designed a line of basic storage components based on earlier storage wall concepts. It not only provided desperately needed home storage space, but also could be used as a space divider of living areas. Nelson’s 1949 unique "ball" wall clock with individual projecting balls radically arranged to represent each hour, was manufactured by the Howard Miller Clock Company and is sometimes called the "atomic" clock for its resemblance to atom symbology. The company also manufactured classic plastic "bubble lamps," also designed by Nelson. In 1956 Herman Miller introduced the Coconut Chair and the Marshmallow Chair; both designed by Nelson. In 1959 Nelson designed the US Information Agency’s (USIA) exhibit, "American National Exhibition of American Culture," opened in Moscow's Sokolniki Park by Vice President Richard Nixon. In 1964, Nelson received an Alcoa Industrial Design Award for Herman Miller’s Action Office Furniture, a revolutionary new office system. In 1966 Nelson designed the exhibition, "Hand Tools USA," held in the USSR by the US Information Agency (USIA) and in 1967, another USIA exhibit in the USSR: "Industrial Design USA." In 1983 he planned the installation of the exhibition, "Design Since 1945," organized by Katherine Hiesinger that opened at the Philadelphia Museum of Art.